F1 X D1 = F2 X D2. In physics, a lever (from Old French levier, the agent noun to lever "to raise", c. f. levant) is a rigid object that is used with an appropriate fulcrum or pivot point to multiply the mechanical force that can be applied to another object. This is also termed mechanical advantage, and is one example of the principle of moments. Definition 1: The fulcrum is the pivotal point where the lever rotates. Definition 2: The mechanical advantage (MA) is the factor by which a machine multiplies the force put into it. Definition 3: The effort arm represents where force is input. The effort arm is always larger than the resistance arm. MA = length of effort arm ÷ length of resistance arm. The earliest remaining writings regarding levers date from the 3rd century BC and were provided by Archimedes. Give me the place to stand, and I shall move the earth is a remark of Archimedes who formally stated the correct mathematical principle of levers (quoted by Pappus of Alexandria). In ancient Egypt, constructors used the lever to move and uplift obelisks weighting more than 100 tons. The force applied (at end points of the lever) is proportional to the ratio of the length of the lever arm measured between the fulcrum and application point of the force applied at each end of the lever. Mathematically, this is expressed by M = Fd. 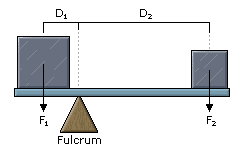 There are three classes of levers representing variations in the location of the fulcrum and the input and output forces.